Information about our Legal Status and structure and the high service standards we work to. Dogs for Good is a company limited by guarantee and a registered charity governed by its Memorandum and Articles of Association. Under the terms of the Memorandum of Association of Dogs for Good, one member of the board of trustees must be a disabled person having the use of an assistance dog belonging to the charity. The board of trustees oversees the work of the charity and meets four/five times a year. The Chief Executive is responsible for the day to day operations of the charity and has powers delegated by the trustees. The executive team, headed by the Chief Executive, comprises of the Director of Training and Development, Director of Finance and Director of Marketing. There is a Finance Reporting Committee that regularly reviews financial information and recommends issues to the full trustee board for further discussion agreement. Other ad hoc committees are set up as and when required. Meet our executive team and our trustees. Dogs for Good is committed to the highest possible service standards in all of its work. Dogs for Good is a fully Accredited Member of Assistance Dogs International (ADI) and meets the ADI standards in its assistance dog work. View the ADI standards here. Dogs for Good is a member of Assistance Dogs UK. Assistance Dogs UK is a coalition of assistance dog charities all fully accredited by Assistance Dogs International. Dogs for Good is a Full member of Animal Assisted Intervention International (AAII) and adheres to the AAII standards in its community dog work. View the AAII standards of practice here. 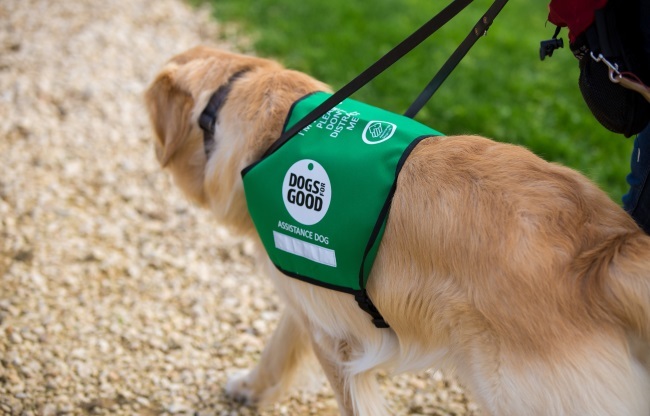 Staff from Dogs for Good have played an active role in advising and facilitating the creation of standards across many areas of relevant work including dogs working in schools (Kennel Club’s Bark and Read scheme) and dogs in healthcare settings (Royal College of Nursing protocols). Dogs for Good is a Kennel Club Assured Breeder.